This performance index is now widely used by the public for measuring the performance of investment or fund manager. The formula can be thought of as calculating the excess returns a fund manager has made over the broader market. An example of a broader market is the S&P 500 composite. A positive value indicates good securities picking skills of a fund manager. If you are comparing the Jensen's Alpha of similar portfolios by different fund managers, then the bigger the Jensen's Alpha indicates a better performance of the fund. This spreadsheet provides a basic template for calculating the Jensen's Alpha. It uses monthly data of the portfolio and the broader market over a period of 1 year for the calculation. This can be easily expanded to 3-5 years period commonly seen in investment reports. The Variance of the Portfolio and the Market is first calculated followed by the Covariance of the Portfolio with respect to the broader market. 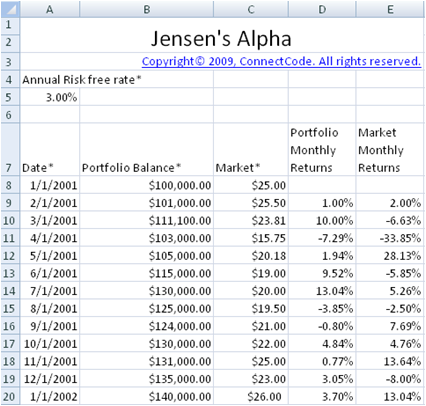 The S&P 500 composite data can be used in calculating the Jensen's Alpha of a U.S portfolio. The Variance and Covariance are then used in the calculation of the Portfolio's Beta. This Beta is used for calculating the Expected Return of the Portfolio using CAPM. The calculation of the monthly Risk Free rate is as shown below.